The burst of color from African violet flowers can really brighten up your home and perk up your spirits. Is your thumb more brown than green? 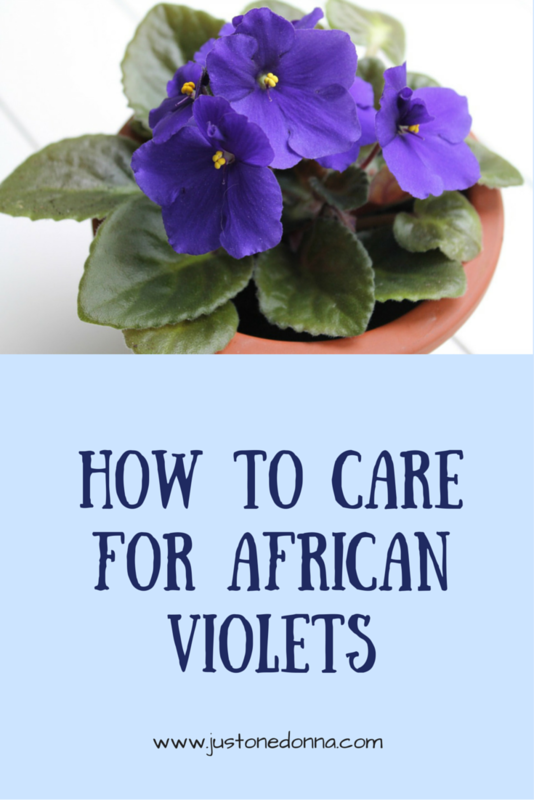 Not to worry, African violet care is very easy. 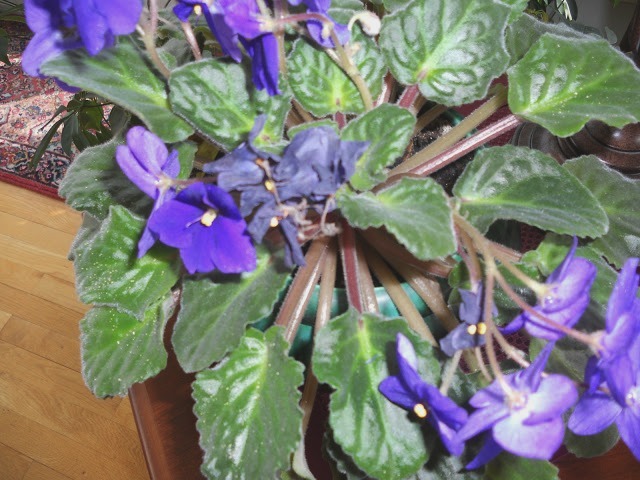 Read on to learn the best tips to care for African violets. 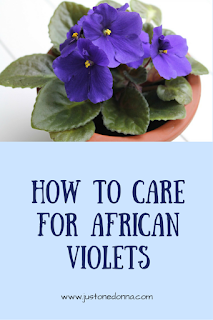 Here's a nine-minute video that will show you how I care for my African violets. African violets like diffused, bright light. I have them in rooms with either a southern or a western exposure. That's not to say that you can't grow them in other sunlight exposures, but these work beautifully for me. It's best not to put your plants on a window sill. Try tables placed near windows, but not directly on the sill. African violets prefer stable temperatures from 65 to 75 degrees F and the nighttime temperature on a windowsill may be too cool for them. Water from below. Plant African violets in pots that encourage watering from below. The pots I prefer most come in two parts having an outside ceramic pot with an unglazed pottery insert. This allows for water placed in the base of the glazed outside bowl to be slowly absorbed through the unglazed pot holding the plant and the soil. My pots work beautifully. You can see how big and healthy my African violet is. Watering becomes a no-brainer activity with pots like these. Every couple of weeks I check to see if all the water has been absorbed and if it has, I'll add more to the glazed pot. Use African violet soil. The soil used for my African violets is special African violet soil available in bags commercially. You can find suggestions for mixtures of soil to use with African violets on the Internet, but you will grow beautiful African violets with the soil you can buy at the local garden center or Home Depot. Fertilize occasionally. There is special African violet fertilizer available as well, but I don't bother with it. Three or four times a year, I give all of my houseplants a good watering with Miracle Grow 10-10-10 water-soluble fertilizer. The African violets get a dose at that time. That's it. Groom as needed. African violets require occasional grooming. When the blooms fade and dry out, as you see in the picture below, just pull them off. Some of the leaves around the base of the plant will wilt and droop. Those should be pulled out and discarded. Re-pot when needed. Once a year, assess whether your plants need re-potting. The African violet in the pot above definitely needs re-potting. It looks like it has had little baby African violets. I'll need to pull it out of the pot get the full picture. All I need is a bag of African violet soil and a new pot to get started. I am ready to go. 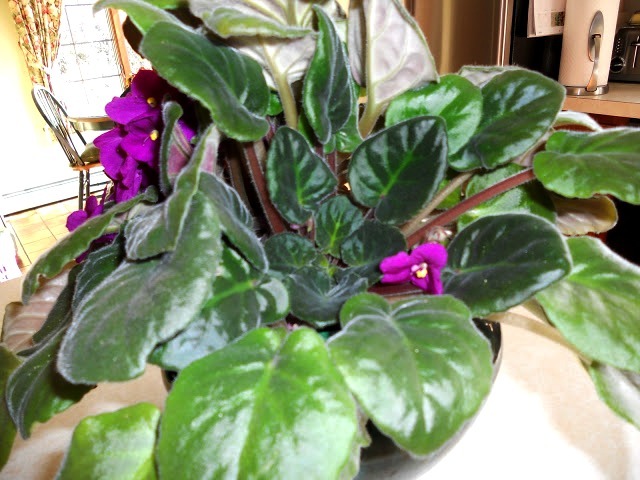 I spread newspaper on my kitchen island and pulled the African violet plant out of its pot. The roots told me it was definitely time to re-pot this plant. Next, I looked at the base of the plant and saw the main plant and two additional plants, one just a tiny baby plant. I prepared a pot for each of the plants. The little baby plant is in a small starter pot. It will need a bit of attention to be sure it thrives. I filled each pot with new African violet soil and pressed the soil firmly around the plant. Don't try to use any of the old soil because it is really worn out and needs to be discarded. The result...three African violet plants from one. One for me, one to gift and one to grow! You can't beat that with a stick! African violets for your home...a simple, yet beautiful thing. 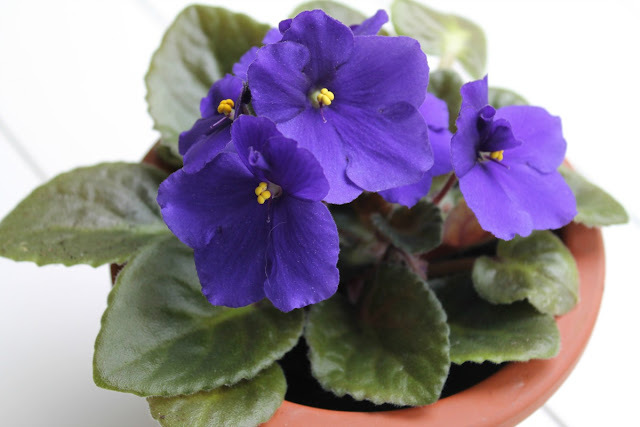 Follow these simple steps for growing and caring for African violets and you will be rewarded with colorful indoor blooms. How do I get them to bloom? Where can I go to order more plants? Follow the steps as I described above and your African violets will bloom. Just like any flowering plant, there is usually a little rest period after a bloom. I can't answer the question about where to go to order more plants because I don't know where you are from. My best suggestion is to try a local flower shop or garden center. Hi Tamara. I hope you find that this information helps your African violets thrive. Mine continue to grow, reproduce and thrive with the tips I have shared. I have a african violet in my south bay window of my kitchen. It has started gettinv brown leaves, what do i do about this. My flower is always in full bloom and seems to like it in the window. It's hard to say what is causing this without seeing the plant. It is normal for some leaves to turn brown and wilt. Just remove them. More new leaves will replace the ones you take off. If you've had the plant for a while it might need repotting. Did you watch my video? If not be sure to take a look at it. My great aunt had the greenest thumb in the family. She said she used to use coffee grounds on them. Have you heard of this? That's a new one for me, BES! I do know many people use coffee grounds in their outside gardens. Hi! How do you deal with an extremely crooked neck? Thanks for the post - I love my violets! Hi Beth. I’ve had some success just repotting the plant by positioning the neck so that the plant is upright in the soil. That means the neck may be more horizontal than vertical in the soil but it seems to be ok.
Hi Donna, I am going to purchase the plant food on the Amazon site. How often should I feed them? Thanks. Hi, Be sure you follow the directions on the package for mixing the fertilizer. I’m not a big fertilizer user for my African violets. That means I only fertilize occasionally, not more than once a month. I do always fertilize after I transplant/repot. I live by the phrase, “Less is more” with my plants. Too much water or fertilizer is never a good thing. Good luck!!! Hi... thanks. Is there a difference between plant food and fertilizer? Kelsey, I think that is you buy a product specifically made for African violets you will be in good shape whether it is called plant food or fertilizer.